The records of the Land Tax, levied annually from 1692 to 1949, have been widely used to investigate the characteristics of land holding in England and Wales over the first two of those centuries.1,2 Although recognised as having inherent uncertainties, their use for a single parish is less problematic. The Land Tax assessments for Tatham are used here to extend the record of named farms and other properties, their owners and occupiers from 1832 back to 1781 (see Appendix). The Land Tax was initially a tax on land and personal property, salaries and tithe income. The land component was a tax paid as a proportion (tax rate) of a land valuation (rateable value), both in principle being adjustable to allow for rising value or increased Government need. The tax collection system was modified in 1698 by expressing the tax as a quota to be raised by individual counties. An indirect consequence of this was that the quotas, after initial variation, became fixed for a long period despite the rise in land values. Also, for a long period the tax rate (poundage) remained at 4s in the £1 (20 %) with that finally becoming fixed in law in 1798. The quotas varied between counties in their relationship to any common basis of property value and, furthermore, varied between the townships of a single county.2 As a result, Tatham ended up with a notably low tax quota relative to the property valuations. From 1798, exemption (exoneration) from the taxation could be obtained by a single payment of 15 years taxation. Despite this, tax assessments continued to list all tax payers, because ownership of property over £1 was a criterion of a right to vote. For that purpose duplicate lists were made for the Quarter Sessions from 1780. In addition, properties valued at less than £1 were officially exempted in 1798 but, fortunately for historians, this does not seem to have been generally applied2. In the Parish of Tatham in the division of Lonsdale South in the County of Lancaster. An Assessment made for granting an Aid to His Majesty by a LAND TAX to be raised in Great Britain, for the service of the Year 1826, in persuance of an Act of passed in the 38th Year of the reign of His late Majesty Geo. III, for the service of the Year 1798, and of another Act passed in the 42nd Year of His said late Majesty’s reign intituled “An Act for consolidating the several Acts passed for the Redemption and Sale of the Land Tax into One Act and for making further Provision for the Redemption and Sale thereof”. The Assessments comprise the tax to be paid for each land unit and the name of the owner, and tenant when relevant, variously described as Landlords & Farmers; Landlords & Tenants; Proprietors & Occupiers (from 1806) (NB Landowners & Occupiers in the 1848 Tithe Act Survey). However, before 1791, only one person is listed, usually clearly the landlord except in the case of major landlords when it was apparently the tenant, e.g. tenants of Charteris, Marsden or Dawson of Hornby Castle, or of Cansfield or Gerrard of Robert Hall. The term landlord is used also when there is no tenant, although it is not clear whether they occupied the property or whether it was just empty between tenancies. It is obvious also that customary tenants of the Lord of the Manor were treated appropriately as landlords and proprietors, as they had the right to sell and let their property. The later printed forms also included a column for rents but, unfortunately, this was never filled in for Tatham. Place names were only included from 1826 onwards, with three exceptions, but it has proved possible to reconstruct most of them for the earlier years, by backward projection from individuals’ names, tax value and list order. Although none of these is indicative on its own, two together is regarded as good evidence. (Locations for which there is some uncertainty are considered in the Appendix Notes). These Land Tax Assessments were compiled and the taxes collected annually on a parish basis by local persons, and the resulting assessment and monies collected were later approved by tax commissioners from Lancaster, e.g. 1816: Assessors John Taylor (Lythe) & Joseph Collinson (Four Score Acres); Collectors Marmaduke Robinson (Ringstones) & Nicholas Willis (Mealbank). Fig. 1 Relationship between holding acreage in 1848 and Land Tax assessed in 1816. The assessments were obviously largely based on preceding land values, ultimately going back a century or more, However there was clearly a degree of revaluation on some occasions. Although acreage would have been an important component in land valuation, quality factors such as soil fertility and drainage must have been involved, as is the case with land rents. 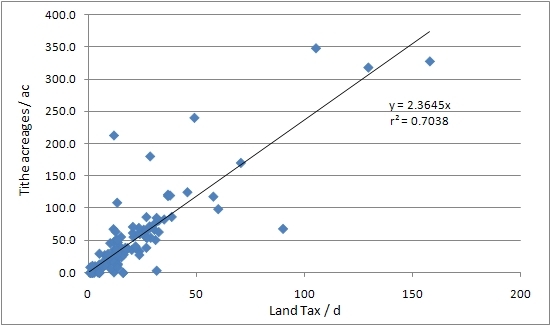 Their relative importance is shown by a regression analysis between the Land Tax for 1816 (this being a year when Hornby Castle Estate holdings can be discriminated) and the acreage of corresponding land holdings in the Tithe Act Survey of 1848 (fig. 1). This shows that about two thirds of the variation in tax is due to holding size (r2 = 0.64) and the remainder to other variables. It also gives a relationship with area as 2.4 acres / d tax (or, taking into account the above tax rate, 0.5 acre / d value). A similar value is given by the ratio between the total tax take for 1832 (£10 2s 10¾d) and the 1831 census figure of 6010 acres, i.e. 2.5 acre / d tax. In both cases the values are estimates of the average acre equivalent.2 However, because of the effects of the additional variables the use of this simple relationship is very limited. The 1831 acreage used is similar to the more accurate figure of 58328 acres for the enclosed land in the 1848 Tithe Survey. That is, the open fells of Burn Moor and Lythe and Whitray Fells are excluded, which tallies with their surprising omission from the named localities of the later Land Tax Assessments. Burnmoor and Lythe Fell comprised 1891 acres in 1848 belonging to The Lord of the Manor, i.e. John Marsden in 1832, and Whitray Fell with 490 acres belonged to the owner of Whitray farm, i.e. William Cragg of Botton. (In the latter case the assessment is too low to have included the fell). The 155 acres of common land, mainly Tatham Moor, also do not seem to be included in the assessment of the adjacent holdings with that name. A property holding, mainly a farm, could consist of a single or several land units, each with its original tax levy, reflecting their separate acquisition by the owner, e.g. the four units at Ivah. Less usefully, several properties under common ownership were sometimes amalgamated for convenience for tax assessment e.g. Hornby Castle and Robert Hall Estates. During the period, eight holdings were amalgamated into other farms and one new one apparently was created (Beethams). The individual taxes ranged from 3/4d (e.g. Lowgill cottages) to 15s 10d for Hall Barns (Tatham Hall). The total tax take for Tatham varied around £10, about half from each division. The vast majority of land units had low taxes which, when converted into the probable farm holdings for 1816, translates into 75 % less than 28d; 50 % less than 19d; 25 % less than 10d. If that distribution is translated into acre equivalents then half the holdings were of less than 47.5 acre equivalents. Whilst individual tax levels are fairly constant over the years there were some changes of greater significance. Thus, in 1798 there was a general reduction, by about 16 %, of most properties in the Lower Division which did not affect the Upper. However there is no evidence in either Division of a systematic increase of property taxes, either by revaluation of existing units or creation of new holding units which might indicate an enclosure of common land. Exonerated and non-exonerated holdings are listed separately from 1806 onwards. A high percentage of holdings, about 80 %, was exonerated throughout that period, in contrast to the pattern in other areas.2 Thus, all the administrative effort expended after that date collected only about £ 2 of tax per year. The nature of land ownership and tenure in Tatham in 1786-1823 has been examined using the records for 101 of the properties considered to be inhabited in 1823 and which have appropriate details. In 1832, land ownership was distributed between a large number of different ‘landlords’ (includes owner occupiers) (80 %), with most owning only one property in the parish (67 %). Of those with multiple properties only four owned more than two: the estates of Hornby Castle (5) and Robert Hall (4), John Charnley (3) and William Smith (3). In 1786, there were a smaller number of landlords of one property (75 %) and more with multiple properties (32 %), four having more than two: the two estates and Reverend Mr Wray (3) and William Varley (3). Land tenure in 1823 was characterised by a high proportion of property being tenanted. Thus, only 25 % of the properties were owner occupied, following a significant drop from 41 % in 1786. Again significantly, over a half of these early owner occupiers or their families or descendants became landlords with tenants. This important development was probably linked to the increasing employment or investment opportunies in industry elsewhere being were more attractive than life on the family farm. Another feature was the relatively high turnover of both ‘landlords’ and tenants. On average over the 47 years, each holding changed landlord 3.8 times but with a third of these being within the family, giving the average duration of a landlordship as 12.9 y. For tenants, the average number of changes for the period was 4.1, with only 13 % being family, giving a tenancy average duration of 11.5 y. The similarity between these two turnover rates suggests a causal relationship. 1 M. Turner & D. Mills, Land and property: The English Land Tax 1692-1832 (Alan Sutton, Glos., 1986), 239 pp. 2 D. Ginter, A measure of wealth: The English Land Tax in historical perspective (Hambledon Press, London, 1992), 711 pp. 3 Land Tax Assessment, Tatham Parish 1781-1832. Lancashire Record Office QDL/LS 39. 4 Parliamentary Paper 1818 (82): … Maintenance of the Poor in England. House of Commons Papers Online. 5 Parliamentary Papers 1831-2 (577): An account of the valuation of every parish… for the County Rates. House of Commons Papers Online. 6 M.E. Turner, J.V. Beckett, & B. Afton, Agricultural rent in England 1690-1914 (CUP, Cambridge, 1997), 356 pp.